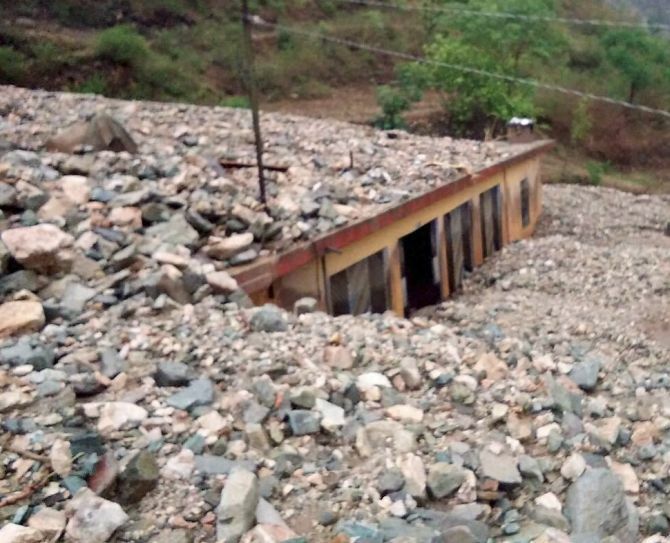 Heavy rains triggered a series of cloudbursts in Tehri district on Saturday, damaging hundreds of houses in over half a dozen villages in Balganga valley and disrupting the Char Dhaam Yatra leaving hundreds of pilgrims stranded but there was no report of any human casualty. District Magistrate in-charge Ahmed Iqbal said, “Ghansali SDM Vinod Kumar along with a team of police personnel has been sent to the affected area to take stock of the situation”. The cloudbursts took place about 3 pm on Saturday over Kothiara village bringing around 50 residential houses under loads of debris. About a 100 animals were also buried alive under the debris. People ran for their lives as the cloudbursts took place and so far, there has been no report of any loss of human life. Similar cloudbursts took place at Kemra and Siliara villages washing away the Siliara motorbridge. A number of two wheelers and cars were also buried under tonnes of debris that inundated the villages. Two storeys of Ambedkar Hostel were buried under the rubble. Twenty residential houses in Kemra and fifty in Siliara came under rubble. A flash flood razed the Brightlands Public School building in Gir village, Iqbal said. A large number of residential houses at Gangar village were buried under the debris but so far there have been no reports of human casualties. SDM Vinod Kumar said, “The Ghansali-Akhori motor road has also been blocked because of heavy rains and the stranded char dhaam pilgrims are being evacuated to safety”. Review: Naseer-Kalki's Waiting is absolutely riveting!